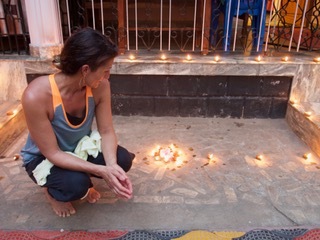 Madeleine Lesser (Maddy) is leading a retreat at Kailasam Yoga in March 2019. Maddy has been teaching Meditation since she was 18. In 2006 she qualified with the British Wheel of Yoga and has been teaching Yoga and Meditation full time ever since. Maddy is also qualified to assess Student Teachers. Still a keen Yoga student herself, Maddy attends classes with her teachers at least 4 times each week. Her teachers are Digby Platt and Ben Beswick – the leading Astanga Yoga teachers in Warwickshire, and Vettri Selvan who teaches Traditional Therapeutic Yoga. Maddy Co-runs Old School Yoga Studio, Stratford Upon Avon. And also is the Yoga Teacher at Holycombe Retreat Centre, Whichford. She has had the great fortune to study with many wonderful teachers including Hamish Hendry, Shiva Rae, Liz Lark, Joey Miles, Guy Donahue, Manu Rossi, Peter Sanson, Mooji and Satyananda. The two weeks in Kerala will be a time to recharge and totally refresh. Suitable for all abilities – even if you’ve never done any yoga, and all ages. Everyone is welcome. The morning Yoga practice will be Vinyasa, with some chanting and Pranayama. In the evening we will meet again to learn and practice some meditation techniques. This will be Maddy’s second visit to Kailasam and we are delighted to welcome her back after her very popular and successful retreat in April 2018. The aim of the retreat is to encourage students in a warm, openhearted and joyful environment. There will be plenty of time to chill and explore, eat wonderful food, have Ayurvedic massages galore and deeply rejuvenate in wonderful surroundings. Maddy will be teaching at Kailasam from 3 -16 March 2019.